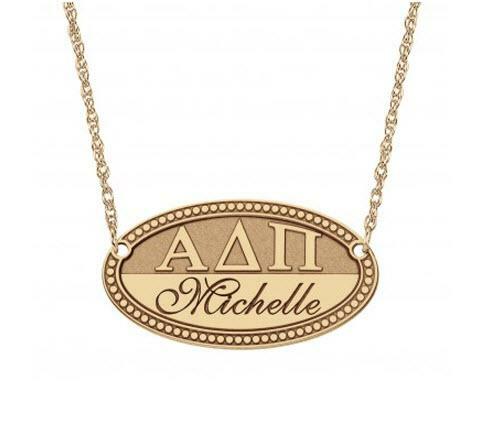 Personalize the oval name plate which shows off your Greek letters and your name in a beautiful cursive font. It features Greek letters on a recessed background to make them really standout and your name engraved in cursive. Show your Greek pride with this beautiful oval personalized Greek letter name plate. Makes a perfect gift for any of your sisters graduating or what a great way to welcome your new little sister! Included is a 16 or 18 inch chain and your choice in metal type. Please indicate the three Greek letters and name exactly as they are to appear in the text block. Price: $160.00 In stock! - Browse this brandOur products are custom made to your specifications. This product ships up to 3 weeks after your order is placed.